As I reflect on my first year on the tenure track last year, I realize that many of the connections I formed with colleagues across the university resulted from my involvement in events offered by the Pew Faculty and Teaching Learning Center (FTLC) and attending two Faculty/Staff Writing Retreats offered by the Fred Meijer Center for Writing & Michigan Authors. Given that it’s late August 2015 and convocation is tomorrow, I guess that this post is better late than never. We’re already rounding the corner to the beginning of year two! The two FTLC programs that were the most impactful were The Inaugural Winter Teaching Life Retreat: Applying the Wisdom of Remarkable Women Leaders (December 2014) and the Strengths Based Leadership Teaching Circle (Winter 2015). The retreat and teaching circle encourage introspection. In many ways the self-reflection was fueled by two books, which centered our discussion, How Remarkable Women Lead: The Breakthrough Model for Work and Life by Joanna Barsh and Susie Cranston and Strengths Based Leadership: Great Leaders, Teams, and Why People Follow by Tom Rath and Barry Conchie. Being in this community also encouraged me to read Daring Greatly: How the Courage to be Vulnerable Transforms the Way We Live, Love, Parent, and Lead by Brené Brown as this is the book women who participated in an earlier program had read the previous year. The writing retreats allowed me to focus on book manuscript revisions. Sitting with other faculty members in relative silence allowed me to center my attention on writing. This retreat complemented the weekly, online writing group that I am in with a colleague. There is a definite value in working in conjunction with one another for accountability purposes as well as in a group where you workshop one another’s work. Many women set out, traveling down academic and career paths, only to discover meaningful work after more than a few turns in the road. The zigs and zags of their career may seem inefficient (surely a straight shot to your goal would seem a better choice). Things are not always what they seem. In most cases, women leaders recall that these zigs taught self-awareness and those zags led them down the path to skills and experiences that opened a door. It was not time wasted. It was their time for discovering what they loved and learning new capabilities (23). From time to time, consciously reframe: Think about your goals and whether you should change them. The formula that worked for you in the past may no longer fit the circumstances. And when you see (or feel) the signs that you are locking in, take a deep breath and head for the balcony. We don’t want you to ever change being open to change (112). Similarly, Rath and Conchie focus on creating weekly, monthly and annual goals to ensure success. Where do you want to end up? Consider your strengths and how they will help move you from point A to point B. Clearly communicate and perhaps even over-communicate what you’re doing and why. Well-defined plans articulate your motivations to faculty, staff, and students that you work with in various capacities. Anticipate the fact new and unexpected, yet exciting opportunities are always on the horizon. Taking advantage of these possibilities opens new doors and facilitates deeper connections within colleagues and students, for example. This does not mean I say yes to every prospect that comes knocking on my door. Rather, I consider how these various openings relate to my larger goals. In my post on the Association for Asian American Studies’ East of California Junior Faculty retreat I discussed the benefits of creating a coherent narrative that links your teaching, research, and service. How does saying yes relate to your broader goals? Find your passion and what drives you to do the work that you do. What gives you meaning? Barsh and Cranston note: “Meaning is the motivation in your life. It’s finding what engages you, what makes your heart beat faster, what gives you energy and creates passion. Meaning enables you to push yourself to the limit of your capabilities – and beyond” (22). Figure out what sustains you in the academy. For me, it’s supporting students of color and other marginalized communities. This is particularly salient given my location in the Midwest where often I am one of the few Asian American faculty students engage with in the Humanities. There are currently no Asian American Studies courses taught on a regular basis. In Fall 2015 I will teach a one-credit course, The Hypersexual Female Asian Body, which explores the racialized and sexualized depictions of women of Asian descent in US popular culture. I also will direct an independent study, “Introduction to Korean Adoption Studies,” with an undergraduate student. Defining what it means to dare greatly, Brown comments: “Daring greatly means finding our own path and respecting what that search looks like for other folks” (231). Daring greatly means embracing vulnerability and not allowing fear to stop one from achieving their goals. To this end, Brown notes: “Vulnerability is the birthplace of love, belonging, joy, courage, empathy, and creativity. It is the source of hope, empathy, accountability, and authenticity. If we want greater clarity in our purpose or deeper and more meaningful spiritual ways, vulnerability is the path” (34). As part of this process, we also need to embrace or at least recognize that imperfection is not a negative. Brown writes: “Perfectionism is not the path that leads us to our gifts and to our sense of purpose; it’s the hazardous detour” (128). One of the areas that I find this advice to be particularly helpful is with writing. Learning to share drafts of manuscripts, articles, and chapters early with colleagues is an acquired skill. This is where writing groups and friends/colleagues are helpful. Soliciting feedback on an early, unfinished piece of work may feel daunting, but it is an invaluable process. Earlier in June my news feed on various social media sites (okay, let’s be honest, Twitter and Facebook) was abuzz with coverage of Rachel Dolezal. 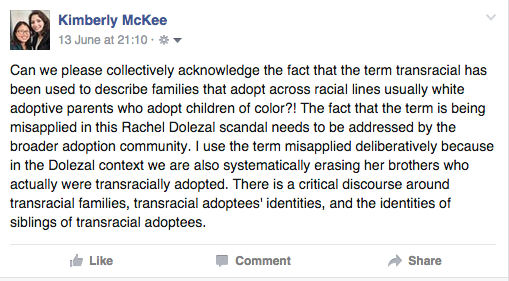 Yet unlike many of feeds, folks discussing Dolezal were concerned about the misuse and misappropriation of the term transracial. One of the earliest adoptees discussing this in a public forum was Lisa Marie Rollins, founder of Adopted & Fostered Adults of the African Diaspora. 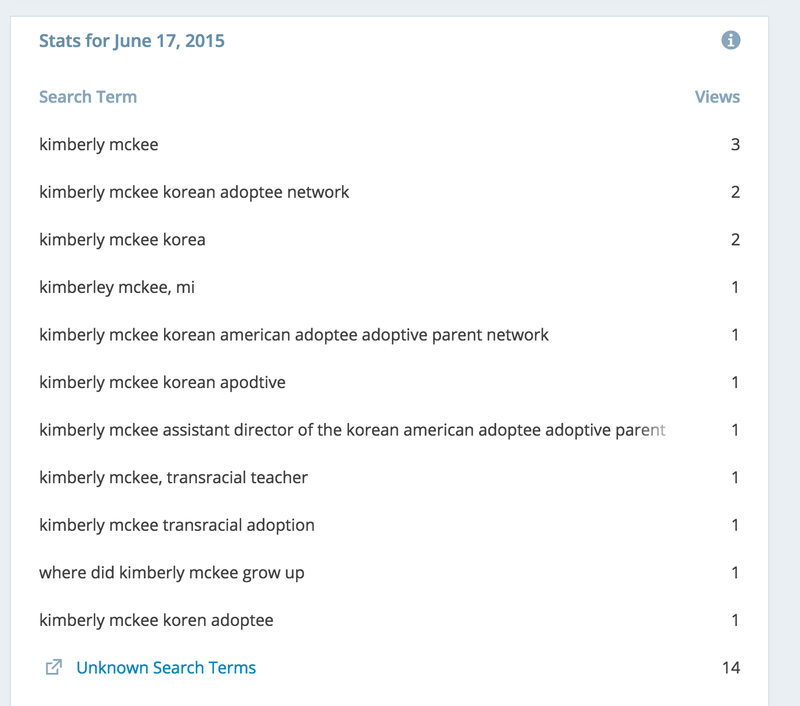 The statement demonstrates the power of adoption coalitions between transracial, international, domestic adoptees and the allies we have formed with adoptive parents and non-adoptees alike. Since I joined the Adoption Studies community in 2007 as I finished my MSc Gender and Social Policy degree, I have witnessed the friendships and communities forged between these various populations. From the work in Gazillion Voices to the women writing for The Lost Daughters, the diversity within the adoption community is at our fingertips. Shannon Gibney, educator, activist, and author of SEE NO COLOR (Release date: November 2015 by Carolrhoda Lab). She was adopted by a white family in Ann Arbor, Michigan in 1975 and currently lives with her husband and children in Minneapolis. Robert O’Connor, founder and principle trainer at TransracialAdoptionTraining.com. Robert is an adult transracial adoptee of African-American descent. He and his older brother experienced multiple failed adoptions and foster care prior to being transracially adopted at the age of four. He grew up as part of one of the first generations of transracial adoptive families. Susan Harris O’Connor, a nationally known solo performance artist and author of The Harris Narratives: An Introspective Study of a Transracial Adoptee. She is also a professional coach/consultant and director of quality assurance and adoption services at Children’s Services of Roxbury. In 2014 Ms. O’Connor received the Outstanding Practitioner in Adoption Award from St. John’s University. Based on your experiences, why should adoptive parents recognize how racism against communities of color impact their transracially adopted children? How can non-Black people of color, adoptees show solidarity in these movements? How can their white adoptive parents? What do you wish your adoptive parents had known about the racism you encountered in your childhood or adulthood? Given our location in St. Louis, MO for this year’s KAAN, we would be remiss if we did not discuss the grand jury decisions in the deaths of Michael Brown (Ferguson, MO) and Eric Garner (Staten Island, NY), #BlackLivesMatter activism, and the police deaths of other people of color. To this end I’m thinking about the senseless deaths of young boys like Jordan Davis and Tamir Rice, who would have been thirteen yesterday. I’m also thinking of the violence enacted on the bodies of trans women of color including Michelle Vash, Lamia Beard, Tiffany Edwards, Betty Skinner, and countless others. We need to have real, honest conversations about the role of race and white privilege in transracially adoptive families. Adoptees of color regardless of origin share many parallel memories of dissonance and racism. The positive reactions of the audience (primarily Korean adoptees and adoptive parents of Korean children) reflected these similarities. The fact that KAAN brings together various members of the adoption constellation and bridging the imagined divides between domestic and internationally adopted communities is what keeps me coming back to the organization. The organization continues to evolve and reflect the changing face of the adoption community. This is particularly evidenced in the creation of my position and the implementation of the Advisory Council in 2010 as well as the various keynote speakers, performers, and speakers. To give you a better understanding of the conference content, check out the Storify of tweets and Instagram photos. Please note that by mid-July, photos from #KAAN2015 should be available on Facebook. The activism surrounding Dolezal and the misuse of the term transracial alongside my continued involvement with KAAN and its annual conference reminded me the importance of coalitions and community building. Working together to forge deep connections between us yields great change. This is why I’m excited to be working with adoptees as we turn the corner and #FlipTheScript on how popular culture discusses adoption. Lisa Marie Rollins was unable to join us due to unforeseen circumstances. Honorable Judge Draper’s remarks reflected her experiences as a bi-racial Korean-African American and in many ways echoed themes discussed by Gibney, Harris-O’Connor, and O’Connor. From June 15 – 19, 2015, I attended the “Professionalizing the Early Career Digital Humanist: Strategies and Skills” workshop at the Digital Humanities Summer Institute (DHSI) at the University of Victoria in Victoria, British Columbia, Canada. The workshop focused on developing professional and transferable skills that include building scholarly profiles on social media (e.g. LinkedIn, Academia.edu, ORCID), developing or improving a professional website, funding sources to support digital humanities projects, and considering how we may deploy these skills in graduate and undergraduate programs to support students’ professional development. The course summary notes: “These skills–knowledge mobilization, working collaboratively, maintaining an effective online presence, clear-language research communication, networking, project management–can help digital humanists ensure that their work has the greatest possible impact, and that they have the greatest possible opportunity to develop and deploy those skills where they wish.” Thank you to Melissa Dalgleish (@meldalgleish) and Daniel Powell (@djp2025) for a fruitful discussion, helpful tips, and advice last week. I am aware that many graduate students and early career faculty (particularly from underrepresented communities) lack the resources or supports to attend professional development workshops such as DHSI. I was fortunate to receive a DHSI scholarship and support from my university to attend. Thank you to Assistant Vice President for Academic Affairs Maria Cimitile and Brooks College of Interdisciplinary Studies Dean Anne Hiskes. And thank you to my department chair, Wendy Burns-Ardolino for being supportive of my work and research. I am deeply committed to sharing what I’ve learned at conferences with colleagues and friends. We don’t do enough of this in the academy. For a deeper understanding of what occurred within the “Professionalizing the Early Career Digital Humanist: Strategies and Skills” workshop, I encourage you to view the Storify feed created by Jodine Perkins. For an in depth look at what occurred on specific days, check out “The Life DHSI” by Steve Anderson. Dan Royles also created a feed documenting the work of individuals in the “Data, Math, Visualization, and Intrepretation of Networks” workshop. PRO-TIP: Open an incognito tab in Google Chrome or turn on private browsing in Safari and Google yourself. What comes up first? Did you learn anything new about what people may find? We discussed how we could enhance existing digital profiles. For those with a limited online presence, they learned what tools would be best suited for their needs. This conversation was part of a wider discussion concerning professional websites and search engine optimization (SEO). PRO-TIP: If you do not have a consistent, professional headshot for your profiles, ask your university if you can get one done. If you cannot ask your university, ask a friend. Using the same or a few of the same images will allow for consistency and coherency. 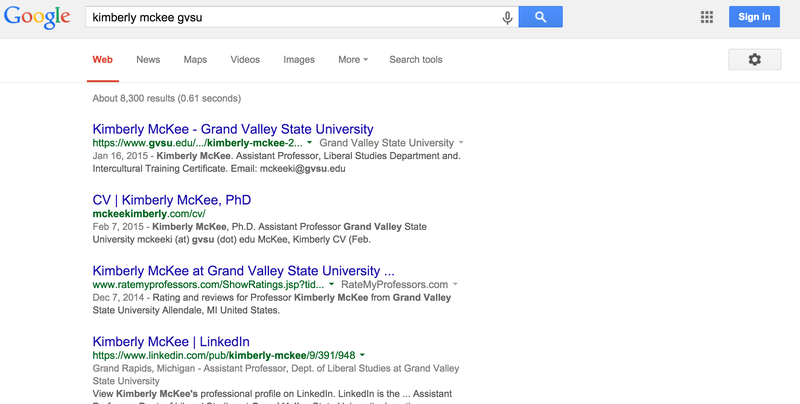 The two images below illustrate what appears when I searched for the following: GVSU Liberal Studies and Kimberly McKee GVSU. Knowing what terms are used to find my website gives me a better understanding of how people find me online. Again, it’s about recognizing that you have an existing digital footprint and taking control of your digital identity. What type of advising and/or professional development opportunities do they need to successfully mark themselves as burgeoning professionals in their chosen fields? How can we help them create a skills based resume on LinkedIn, for example, as well as on paper to adequately capture their capabilities? In the case of LinkedIn, when promoting yourself for a particular job, we were encouraged to insert key skills associated with the job description under our names where one’s job title typically goes. We were also urged to change the summary description to ensure it’s tailored for the position. Because Melissa and Daniel recognize that sometimes those individuals looking at #altac careers, they also noted that we should ensure that our LinkedIn profile settings have been updated to ensure our “connections” are not receiving notifications when our profiles are updated. How do we value the social media site and what is our presence? Do we only tweet during conferences? Is Twitter part of the broader way we network and build community? Melissa and Daniel also noted that depending on our intellectual community connecting via Facebook may or may not be a norm. For me, I connect with individuals affiliate with Asian American Studies, Women’s Studies, and Adoption Studies via Facebook. In fact it was one method used to organize an upcoming 2015 National Women’s Studies Association roundtable and was how I received an invitation to write chapter in a forthcoming edited volume. The latter was a direct result of conversations I had with one of the co-editors at the Association for Asian American Studies conference. The individual modules associated with professional development, more broadly (e.g. elevator pitch, tools for professionalization), built upon one another to allow workshop participants consider the development of a website to enhance their digital presence. We discussed concerns about privacy and whether sharing scholarship online may impede a contract with a university press or negatively impact a journal submission. This particular discussion also explored what it means to host one’s own domain (e.g. Reclaim Hosting) and then utilizing a plugin such as WordPress versus using WordPress directly. As someone who came to the workshop with a working website based on the WordPress platform, I am looking into migrating my site to a new platform such as Reclaim Hosting in order to have more autonomy of my materials and files. I have yet to complete the migration process. I plan on looking into various options and making a decision within the year. We compared two different website building platforms – WordPress versus Square Space and engaged in an active conversation about what happens when your ideal, first choice domain name is already taken. What are the costs benefits of buying .info, .net, .digital versus using .com? For me, I selected mckeekimberly.com because kimmckee.com and kimberlymckee.com were already taken. A quick note about Square Space, many of my colleagues at the workshop who selected this option use many images, which Square Space seems more ready to handle in comparison to WordPress. This judgment is based on observing my colleague’s sites. Great examples of how images are used in Square Space from my class (#DHSI2015 #C32) are from Drew Barker, Greg Chan, and Allison Lange. We also discussed best practices concerning what information we should include on our sites. Melissa and Daniel offered their knowledge and skills about to embed and link documents (e.g. Dropbox or Google Drive files), video (e.g. YouTube), sound (e.g. SoundCloud plugin, podcasts), images (e.g. Creative Commons Flickr images, Instagram), and social media plugins (e.g. Twitter). While website design may seem periphery to how people conceive of digital humanities, if we’re engaged in digital humanities we should have an online presence. This presence should not just merely exist on it’s own. Rather, it should demonstrate our fluency and participation with the online world. And remember, we already have digital footprints. Even if you do not want to build your own website, making sure your presence on the social networking sites mentioned above is clear, crisp, and coherent is critical. To this end, make sure your profile on your university website tells viewers who you are and what you do. Don’t forget that your scholarly presence intersects with your work in the digital humanities. As we pursue various funding schemes, it’s important that we learn how to clearly discuss one’s project to digital humanities scholars and laypersons. They suggested look at Karen Kelsky’s grant template from The Professor is In. Melissa and Daniel also underscored the fact that many of funding organizations are deeply invested in ensuring that digital humanities projects have professional development plans for undergraduate and graduate students as well as postdocs working on the project and knowledge mobilization plans concerning how we intend on disseminating our findings. Moreover, these digital projects may also have both digital and print components. How do these two aspects of the overall project interface and intersect with one another? An example of a digital project is Canada and the Spanish Civil War. This past week was a whirlwind of activity and skills building. After engaging in discussion with colleagues, I created my Academia.edu profile. I had yet to do so as I was not entirely sure of it’s “value-add.” In fact, I am still in the process of developing it and adding a list of publications and conference presentations. It is very much a work in progress. My goal is to at least improve its readability and content during the 2015/2016 academic year. This profile along with my Twitter, LinkedIn and Google+ profiles are connected to my website. How is this website a tool for my undergraduate students? How can I use this site to enhance the content they receive via syllabi and the Blackboard course site? How can digital humanities enhance students’ experiences in their courses? What skills should be developed/strengthened? What knew digital tools should be learned? How may I use my website to effectively support the professional development of graduate students and postdocs? How can we level the playing field for graduate students and early career faculty? How can we provide clear supports for faculty of color and other underrepresented faculty in the field of Digital Humanities? How can I share this information with my colleagues at GVSU and elsewhere? What does it mean to share information online? How is this linked to wider issues re: professionalization? What’s at stake when we don’t value open access? I continue to make revisions to my website. I realize that it is text-heavy, so I am striving to include more photos to make it more eye-catching and appealing. I recognize that my website is a work-in-progress that will evolve and change based on the nature of my research, teaching, and service. In addition, as a work-in-progress it reflects the fact that my digital identity will never be a static presence. Finally, the learning that occurred during DHSI was not limited to the workshops. Rather through conversations with colleagues attending the other workshops occurring throughout Week Three, my interest was peaked in using digital tools such as text mapping, GIS, and data visualization. I have already begun to consider what workshop(s) I would like to attend during DHSI 2016 as new research projects become further developed. The first five occurred during Weeks One and Two of the Summer Institute. As the media buzz kicked off by #RachelDolezal swells around “new” conversations of race, identity, and misappropriation, a national adoptive community organization prepares for its seventeenth annual conference on these same topics. Leaders from across the country will converge in St. Louis, MO from June 26-28, 2015 at an event hosted by KAAN (the Korean American Adoptee Adoptive Family Network). “This conference places adoptee voices firmly at the center of discourse and offers others the chance to learn how to be true allies,” says executive director Stacy Schroeder. She and assistant director Kimberly McKee signed an open letter expressing concern about the recent misuse of the term “transracial” by Dolezal and the media. For over fifty years, transracial is associated with the particular type of adoption – the adoption of a child of a different race than the adoptive parents. Please check out the letter written by adoptees and allies re: why co-opting “transracial” is problematic in the case of Rachel Dolezal. Last week I had the opportunity to participate in the Association for Asian American Studies (AAAS)/East of California (EOC) Junior Faculty Retreat. Organized by Dr. Nitasha Sharma (Northwestern University) and Dr. Min Hyoung Song (Boston College), the daylong pre-conference retreat brought together six senior faculty and eighteen junior faculty. The retreat had two main components: 1) panels on pedagogy, tenure, and publishing/career; and 2) paper workshops. As I have mentioned before, I previously participated in the AAAS mentoring program for graduate students/postdocs the last two years. I signed up to meet with two women whose cumulative body of work (research, teaching, service) that I admire. The mentoring program also allowed me to form new relationships with individuals that I may not have otherwise had if I selected not to partake in the program. In subsequent conversations with my mentor from AAAS 2013, I gained incredible feedback on my book proposal. During the mentoring session at AAAS 2014, I learned about conducting community-based research, oral history collection with students. When the call for applications went out for the AAAS/EOC Junior Faculty Retreat went out during the fall semester, I immediately decided to apply. A dear friend, colleague, and mentor had previously participated in the retreat and enjoyed it. She told me to be prepared to make some great friends and that the mentors were fantastic. Her recommendation along with my previous experience with mentors at AAAS fueled my desire to attend. For our panel sessions, junior faculty participants were asked to submit questions in advance. We also were able to pose questions during the sessions. When we focused on pedagogy, we first discussed the teaching contexts that we currently exist in (e.g. course load, whether we teach Asian American Studies courses, if we teach Asian American Studies content in existing classes). This question framed our discussion around how to best manage one’s time teaching, course prepping, grading alongside our research and service commitments. The conversation also raised the question about whether one should build on the same courses year after year or teach new classes. For me, this past year was spent developing and honing my skills teaching two new courses with multiple sections. I found that this particular method of framing my teaching load has allowed me to see what works and what does not work in the two courses. In doing so, I was able to refine course content. This Spring/Summer semester I am developing a new course. In the fall, I will also be teaching a new course. I will be teaching both new courses (developed Spring/Summer and in the fall) again in Winter 2016. Listening to others’ experiences – senior and junior faculty – was helpful as it provided greater context for what others have done or will do in the future. There were two pieces of advice that stood out to me from this panel session. First, consider the coherence of your teaching over time and create a coherent profile of pedagogical products. In other words, keep in mind whether an overall theme exists in your courses. This will hopefully help as you write your teaching narrative for tenure. Second, be honest about your priorities and what you care about. This advice also applies to how I think about my research and service and the intersections of all three components (research, service, and teaching) in the work that I do. The second panel session explored tenure and promotion. A strong emphasis was placed on the following: ask questions (and be proactive about it), collect as much information as you can, and ask as many folks as possible – diversify your sources. At many institutions, tenure is a moving target and you should read your Faculty Handbook as well as look at recent tenure cases. While some reading this may think that a lot of this information is obvious, sometimes these things are not obvious to everyone. Senior faculty mentors also discussed external review letters, which Karen Kelsky discusses in her Vitae post. Think early on who would be strong reviewers and that conferences are one tool for you to determine who could be these individuals. Consider who has given you strong comments on your work. Overall, be sensitive to the culture of your institution. Every university is different. But, what’s important to remember is that the quality of your work matters and don’t forget to document your achievements for your tenure and promotion binder. Dr. Sarah Park Dahlen has a fantastic post regarding “How to Prepare Your Academic Dossier.” This summer I am attending my institution’s Personnel Portfolio Workshop as I think about my third review in the 2016/2017 academic year. Mentors suggested that completing the workshop early on will be helpful as I prepare my binder. The final session focused on publishing and career. Similar to advice about ensure your overall service and teaching have a coherent narrative, one should consider the long-term view of our scholarship. In other words, think about the coherence of your strategy and consider your publications in relation to one another. Are you able to clearly articulate your overarching research agenda? Lastly, the retreat offered me the opportunity to obtain feedback on one of the chapters from my monograph. The advice from the two senior colleagues paired with my group of six junior faculty (including myself) was invaluable. It also provided me the opportunity to rethink the overall themes running through the manuscript. While what I wrote above only reflects a snippet of these panels, I hope you have a good sense of why I believe spaces like these are valuable. Hearing the senior colleagues and my peers discuss their experiences provided a new opportunity to situate my own experience within a broader narrative. The AAAS/EOC Junior Faculty Retreat is one of the new reasons I thoroughly enjoy AAAS. I spent the entire conference raving about the retreat to my friends and colleagues. The value of mentoring should not be overlooked.